The Breckland is the strangest part of East Anglia, tiny sparsely populated parishes scattered with heaths and pinewoods alternating with vast acreages given over to military exercises and industrialised agriculture. 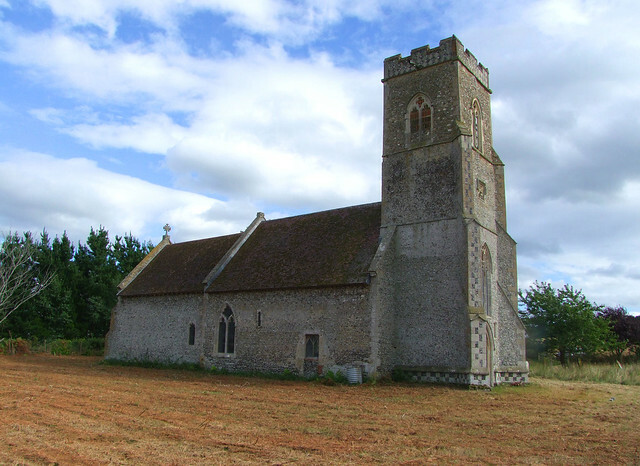 It was one of the most populous parts of England in the early medieval period, and consequently has more disused and ruined medieval churches than just about anywhere else in the country. 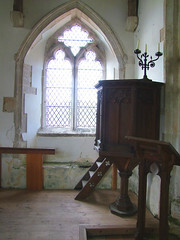 St Andrew was, at one time, disused. 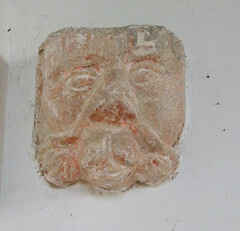 But it escaped ruination, and today is looked after by the Norfolk Churches Trust as well as a small but determined group of locals. 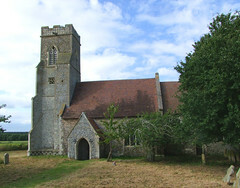 The church is about half a mile from the nearest road, set on the edge of Park Farm. You reach it by a muddy track that goes around the north side of the farmyard, although you can walk along the bridleway which runs along the edge of the field if you are on foot. Or horse, I suppose. 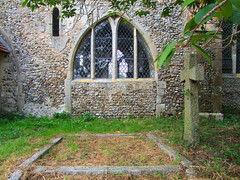 The churchyard is large and rectangular, with a few dozen headstones, mostly of the Victorian period. 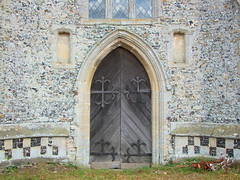 In the mid-19th Century, when rural East Anglian populations reached their peak, Illington parish had fewer than a hundred residents, mostly living and working on the Illington Hall estate, which belonged to the Churchman Long family, who also conveniently provided the Rectors for the church. On this late summer afternoon, the churchyard was a silent place apart from the birdsong and the wind in the trees. It felt magical. 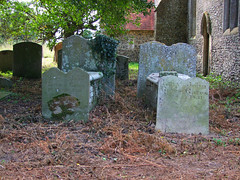 The grass had recently been cut, which made the north side of the church seem barren, but the south side has gnarled trees that stoop and seem to shelter the Illington dead. A late medieval tower, a church against it which is essentially Norman. There was a restoration in the 1840s, which gave the furnishings, and then another in the 1890s which undid some of the work of the earlier restoration, revealing the Norman lancets again. At some point the south aisle was demolished, and the arcade filled in with curious neo-Early English windows, presumably at the time of the earlier restoration. 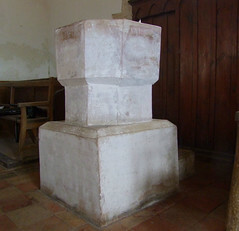 The font is rugged, a bit lumpy on its wide base. 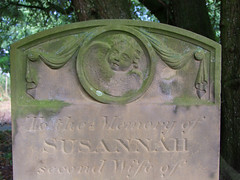 The faded 19th Century stencils on it are haunting. Twenty years ago this place was derelict, but it has been gradually nurtured back to a proper state by the Trust, who made the tower safe and rebuilt the floor inside. This is a simple place, quiet and fitting for Anglican worship. 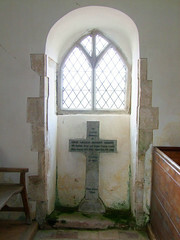 The blocked north doorway contains a marble cross to Lieutenant William Anthony Harvey of the Norfolk Regiment and the Royal Flying Corps. He was captured by the Germans and, after being transferred to an internment camp in Switzerland, died there on 7th November 1917. He was 26 years old. 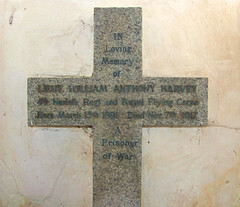 At the time of the 1911 census, the Harveys were living at the Hall, and William was the sole heir to the estates. Now he was dead, and the Hall was demolished soon afterwards.